Genetics and environmental factors play an active role in one’s health and well-being. However, individuals, communities and populations can also directly impact their health and longevity by focusing on preventative healthcare to prevent disease. These measures are applicable for minor illnesses such as colds, as well as chronic diseases including cardiovascular disease, diabetes and cancer. Improvement of present health, and prevention of future poor health, can be achieved through a range of approaches. These approaches can be lifestyle-related such as practicing good hygiene, healthy eating and exercise, or prevention in a medical setting such as health screenings and vaccinations. Working to stay healthy, and stay one step ahead of illness, benefits people physically by helping them to avoid or delay the onset of disease and therefore enjoy a better quality of life. If successful, prevention can have far-reaching effects, creating healthier and more productive people, communities, and workforces. Good personal hygiene goes a long way in preventing the spread of illness and infection. Good personal hygiene includes keeping your hands, body, nails, hair and clothes clean by washing regularly with soap, and keeping teeth clean to avoid gum disease and tooth decay. Washing hands with soap and water after using the toilet, blowing your nose, coughing and sneezing, touching pets or garbage, and before preparing and eating food, avoids the spread of germs and infection from hands to mouth, and to other people. Covering your nose and mouth when coughing or sneezing can protect others from germs, even if you show no signs of illness. It is good to remember that by practicing good personal hygiene, you are not only protecting yourself, but also others, especially those more susceptible to illness due to age or lower immunity. The Centers for Disease Control and Prevention in the U.S. says that “prevention should be woven into all aspects of our lives, including where and how we live, learn, work and play.” As well as hygiene, another major aspect of our lives we can control is diet. 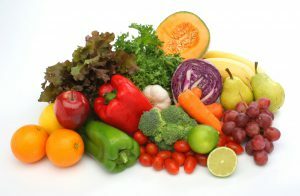 The nutrients we receive in our diet influence our development, growth, functional abilities and health. Good nutrition is therefore essential to get or stay healthy. It helps the body to build resistance to illness and infections in the short term, and to guard against long-term health issues. A good and balanced diet, incorporating a variety from each food group, will help you ingest the nutrients necessary for your body to function at its best, both physically and mentally. As well as filling up on the good stuff, monitoring and possibly lowering intake of sodium, saturated fat, refined grains, highly processed foods and added sugar, will also improve the quality of your diet. Portion size and calories ingested should be paid attention to, as consuming more calories than your body burns will lead to weight gain. A healthy and well-portioned diet will go a long way toward maintaining or achieving a healthy and desirable weight. It will also lessen the risk of obesity, a condition which increases the risk of heart disease, Type 2 diabetes, sleep disorders, high blood pressure and certain cancers. As well as actively introducing healthier food to our bodies, we can also prevent illness by avoiding destructive substances such as tobacco and drugs, and keeping alcohol intake below recommended intakes. 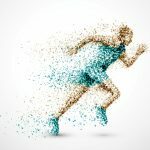 Physical activity has numerous beneficial physiological and psychological effects, and can therefore help to improve health and guard against future health issues, both minor and major, as well as lengthening and improving the quality of our lives. Higher rates of physical activity have been linked to an increase in life expectancy, and the benefits apply to all age groups. Recommendations for physical activity for children are 60 minutes of moderate or vigorous physical activity per day. This should include activities that strengthen muscle and bone, on at least three days. For adults, at least 150 minutes of moderate intensity physical activity, or 75 minutes of vigorous activity, over the course of a week is recommended, with muscle-strengthening activities on two or more of those days. Regular physical activity specifically lowers rates of cardiovascular disease and colon cancer, as well as the risk of developing Type 2 diabetes and high blood pressure. It also helps to build healthy bones, muscles and joints and increase feelings of well-being. Vaccinations are important for preventing illness as they introduce antigens to the body in small quantities, allowing the body to create antibodies, which in turn allows the body to develop immunity to that disease. 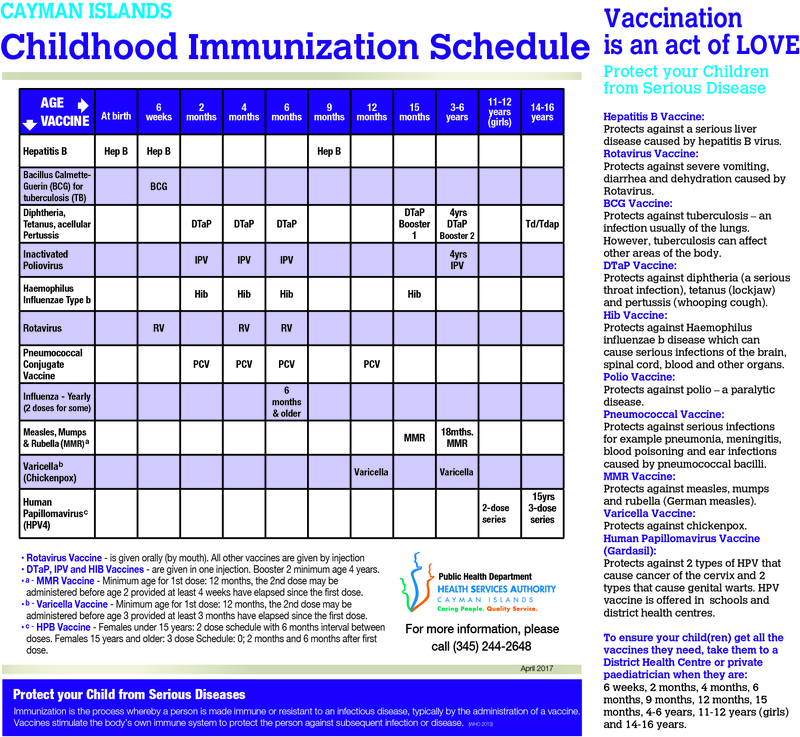 Vaccine-preventable diseases include whooping cough, influenza, measles, tuberculosis and hepatitis B. Children are advised to be vaccinated to protect them during vulnerable ages, and allow them to build immunity without getting sick themselves. 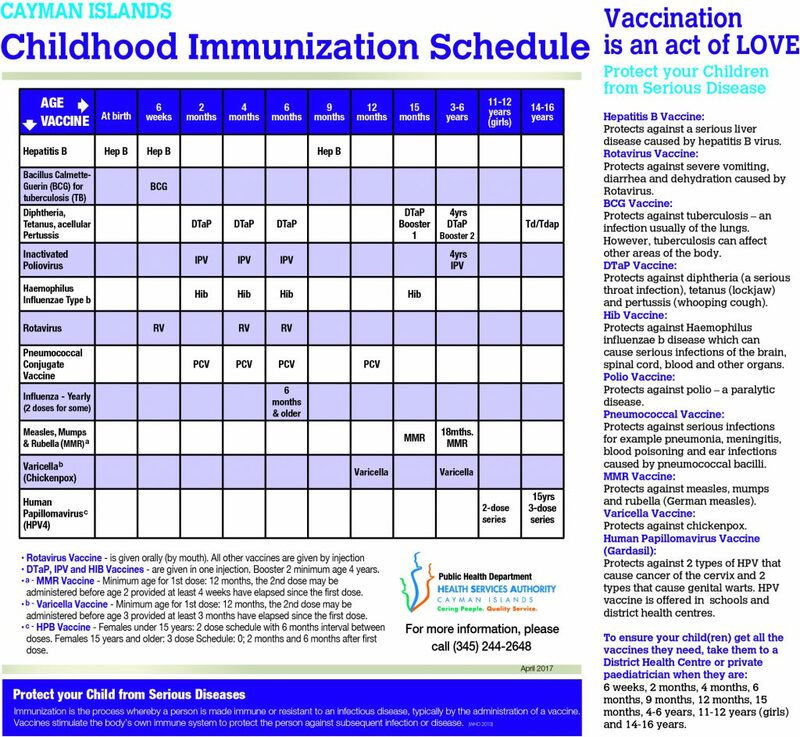 All recommended childhood vaccines are available in the government-financed district health centers. Your doctor can advise on vaccinations which may be applicable to you or your child, as different vaccinations may be more applicable for different life stages. Vaccinations not only protect the individual child or adult, but also the wider community especially those who are unable to be vaccinated or who have weakened immune systems. 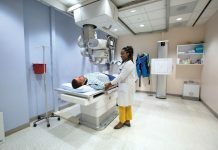 Chronic diseases and health problems such as heart disease, cancer and diabetes can be detected or predicted early through screenings, and treatment success can often be improved through early detection. 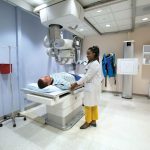 Two of the most prevalent illnesses in Cayman are high blood pressure and diabetes. Medical screenings are available for blood pressure and blood glucose, as well as cholesterol levels, cancers and pre-cancerous cells, bone density, depression, sexually transmitted infections, dental screenings and other medical issues. Screenings can expose both risks of developing certain health problems, or the early existence of them. For example, blood sugar screenings may reveal pre-diabetes, a condition which can be controlled to prevent or delay the development of Type 2 diabetes. The most common fatal illnesses are cardiovascular disease and cancer. 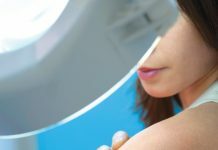 While these and other potentially deadly conditions have a variety of causes, surviving any of them depends largely on prevention and early detection. Regular medical exams and testing can save your life, whether you’re 20 or 65. 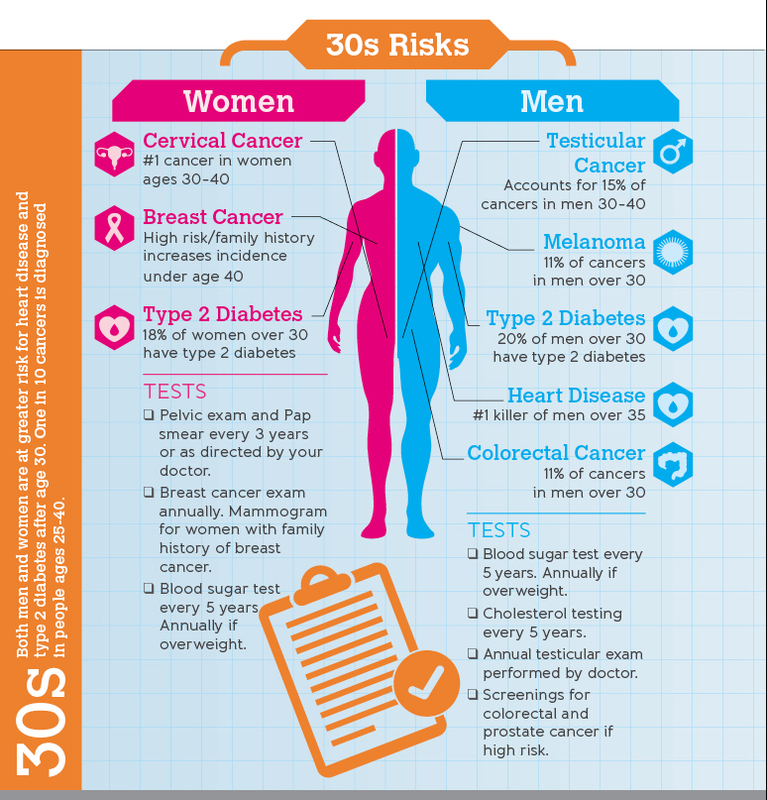 Visit the below links to review risks and testing by gender and the decade of age.